Total chlorine analyzer for water and seawater application. Chlorine has many uses throughout commercial, municipal, and industrial processes. Managing chlorine levels is an important part of many process control applications. The measurement of total chlorine in a water or seawater sample is accomplished with the Rosemount TCL Total Chlorine System. 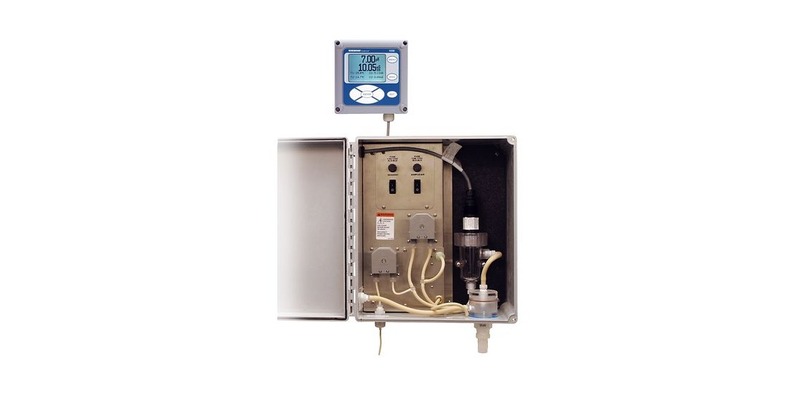 The cabinetized unit includes a sampling system, total chlorine sensor, and transmitter to deliver total chlorine measurement to a control and monitoring system. The cabinet is fabricated from fiber reinforced plastic, making it suitable for marine environments. The transmitter provides analog outputs for temperature and chlorine, with a range of industrial communications options available. The unit contains enough reagent to last approximately two months. Acetic acid and potassium iodide are injected into the sample. The resulting depression in the sample pH allows total chlorine to react with the potassium iodide to form iodine. The sensor measures concentration of iodine, and the transmitter interprets and displays the level of total chlorine from that measurement. The transmitter also serves as the operator interface for diagnostics, calibration, and setup. Sensor maintenance is fast and easy. Replacing the membrane requires no special tools or fixtures. Simply place the membrane assembly on the cathode and screw the retainer in place. Installing a new membrane and replenishing the electrolyte takes only a few minutes. More detail is provided in the datasheet included below. Share all your fluid analytic challenges with process measurement specialists. Leverage your own process knowledge and experience with their product application expertise to develop effective solutions. Total Chlorine Analyzer System from Hile Controls of Alabama, Inc.